The latest adaptation of The Jungle Book is a visually-stunning technical marvel — and it even has a heart for its characters. Talk about the ability for movies to transport audiences to another place and another time. This is a golden example of classic Disney magic that fully realizes a world that doesn’t exist, with talking animals and a human boy who lives among them. The photorealism of the CGI jungle denizens is flat-out astonishing and quite a bit of the movie manages to look like it was shot on location, not in good ol’ L.A.
Based on Rudyard Kipling’s oft-filmed stories, this take is easily the finest — and it even gets to play off the familiarity of Disney’s own 1967 animated classic. The basic story is pretty simple: Mowgli (12-year-old Neel Sethi, in his feature film debut) has been raised in the jungle, mentored by a wolf named Akela (Giancarlo Esposito, TV’s Once Upon a Time) and a black panther named Bagheera (Ben Kingsley, Iron Man 3). An ultimatum comes down from a terrifying tiger named Shere Khan (Idris Elba, Zootopia), who wants to dine on the boy. Skirting around Shere Khan’s interests, Bagheera attempts to usher Mowgli out of the jungle and into the man village for his safekeeping. Along the way, to say the very least, Mowgli encounters a number of colorful characters. The adventure, the atmosphere, the tone and the magic kick into high gear when Mowgli meets Baloo, a lazy bear. The voice behind the bear? None other than Bill Murray (Ghostbusters) and he owns the role in an absolutely delightful take on the character made so popular in the original Disney animated movie. You know. He’s the bear who sings The Bare Necessities. Murray nails it. But so does the rest of the voice cast, including the aforementioned Kingsley and Elba. Scarlett Johansson (The Avengers) gives the ginormous python Kaa a sultry, seductive spin. And it’s easy to picture Christopher Walken (Batman Returns) having a ball as King Louie, a giant ape – introduced by Disney, not Kipling – who wants to obtain man’s mastery over fire. 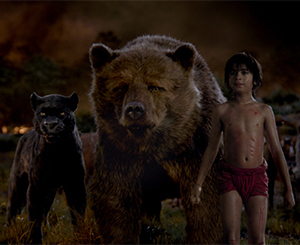 As Mowgli moves from one encounter to the next, he learns about the ways and dangers of nature. It’s quite a role for a 12-year-old and Sethi fills it just fine. Maybe he’s not a slam-dunk like Henry Thomas in E.T., but there’s also no comparing him to Jake Lloyd in The Phantom Menace. There’s a theme running through Mowgli’s adventures that resonates quite well. “Don’t move away from who you are” is given as advice to the boy, one with a gift for communing with both the beasts and the beauties of the jungle. With Mowgli as the bridge between man and jungle, there’s a balancing act going on between the ways of man and the needs of nature; it’s an approach that leaves room for interpretation as to the evils of imperialism and those machinations of man. Here, the leading menace is the “red flower,” or flame, which man has learned to control (to such extent as “control” is possible) and it figures into the movie’s climax. Bagheera is wary of “man’s tricks,” which he argues do not belong in the jungle. They’re the kind of tricks which Mowgli exhibits to his benefit and the benefit of others as he finds fresh ways to navigate the challenges placed in front of him. Sure, he’s raised by wolves, but it’s quite a divide to say it’s either the wolf’s way or man’s way. That’s all part of the charm and the fun of The Jungle Book. There are lessons to be learned and adventures to be had in Kipling’s stories. Director Jon Favreau (Iron Man) has managed a technical achievement loaded with terrific performances and it’s a foregone conclusion Mowgli will be back; a sequel is already in the works.